We are not shy to say to tell you that this is indeed the best homemade clay we've ever made. Finally, we've decided to share our recipe with you after receiving so many nice comments from our website visitors about our cute mini figurines. Yes, you right! most of those cute little things were made with this clay. This recipe was inspired by the homemade clay made for Chinese dough figurines. If you've ever seen the clay, you'll just love it. It's smooth, soft, and the Chinese artisan said will last for decades. Anyway, you will never get complete and detailed recipe from them. Trade secret? Well, at least after some searching and experimenting, we are very happy with our own homemade clay recipe. It's our pride and joy to share the recipe with you all. Let's get to the detail now. Btw, you can add more vinegar or moisturizer if you feel that the clay is still hard after kneading. After receiving many comments from you about the above recipe, I have decided to record my steps and measured the ingredients I used in details. In the past, I've made the clay based on my feeling. Means, I will add lotions if the clay too hard or add flour if the clay too soft :) And, I expect you to do the same. But, some of you may just begin with clay craft and have never made homemade clay and confused with it. Some of you have also asked me to retake my video tutorial with clear steps and measurements. First of all, mix item number 1 to 6 in the bowl. Then, add corn flour/ corn starch. Knead the clay lightly. The clay is stretchy at this stage but will be too soft to use. Finally, add the flour again (item number 9) and knead the clay for about 15 -20 minutes or until the clay smooth and pliable. 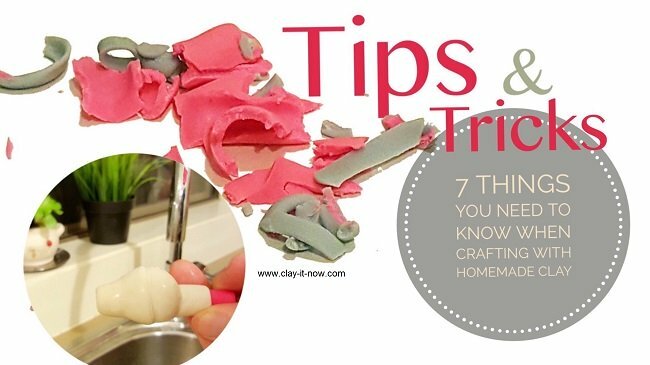 How to color homemade clay? The beauty of this recipe is you can use anything to color the clay when the clay still wet or after the clay completely dry. Any brand of paints is good but my favorite is Daler-Rowney. You can use food coloring (liquid or powder), watercolor paints, oil paints, pastel, chalk. 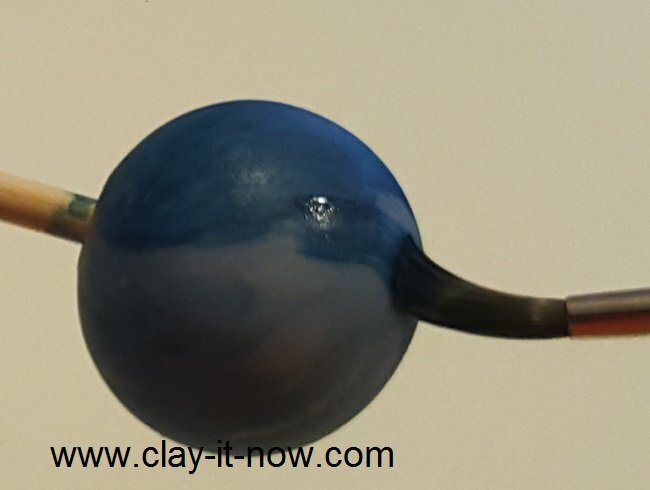 Check out our Clay Coloring Technique page for more details. Now, click on the link/ image below to see my video. Wendy Grazier shared her experience making the clay with my recipe. It was summer in her place, very hot and humid. She have to add about 1/3 cup of flour to have the right hardness add pliable clay. The other way, it is winter in my place when I play with my clay and recipe so my measurement is perfect for me. Summary? I think we still have to adjust the quantity of flour :). Visit our video tutorial and see all comments there.